This is a great little changing table for my daughter's nursery. I like the sturdiness of it when put together. I would buy it again and recommend it as well. 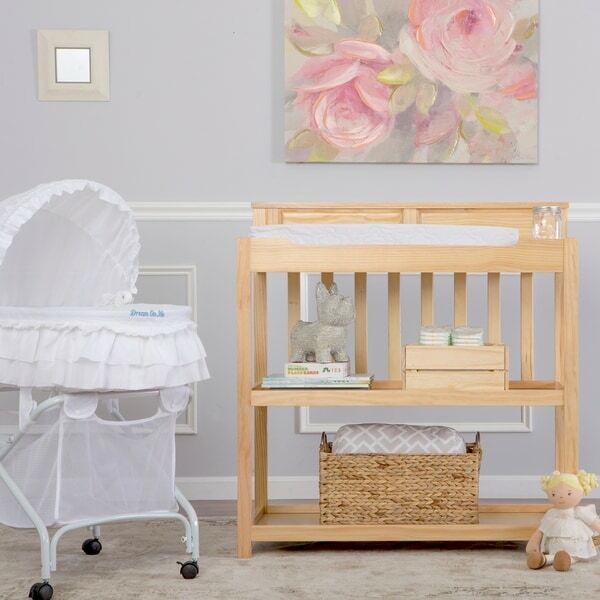 The Dream On Me Zoey is a beautifully crafted, functional changing table with cushioned pad and safety strap for extra security. It features two roomy shelves for open storage, which is ideal for diapers, wipes and other essentials. When table is no longer required, it transforms into two variations of a twin size bed. (Twin bed frame sold separately). Dimensions 39.0 In. X 19.0 In. X 41.0 In. Love this changing table!!! The color is beautiful and it's tall so it works great for my husband and I. So much storage space too!!!! "Is this solid wood and if so what type of wood? Please confirm there is no MDF used." This changing table does use some MDF.